Recently I receive this email from Juha Manninen in Finland, and I think both it, and my response, might help many people understand the roles of both a bit better. From Juha to Savory Institute. Allan Savory is clearly right about how to treat grasslands. Wow! However, in many occasions he hints that grasslands are “better” or more preferable than forests. I don’t understand why. The fact is that lots of currently desertified land used to be forest. Trees were cut, then cattle was grazed. The animals ate new tree seedlings thus preventing the forest to regenerate. As Allan noted, it does not depend on the amount of rain. Even very wet places have desertified. Planting trees in such areas is a very logical thing to do in my opinion. Allan emphasizes in his talks that reforestation projects have failed, which is not really true. Trees can photosynthesize more than most other plants. They can do it also in early spring and late autumn in climates having a cold winter. They can prevent erosion better and pull nutrients from deeper with their big roots. Their operating efficiency is just superior. Actually Allan’s videos show lots of trees. Some lands are between a forest and a grassland. He even mentioned how tree seedlings have appeared thanks to his holistic management. Apparently he is not against trees. Another question then: how does he prevent the cattle eating those tree seedlings? A tree takes many years to grow so big that a cow or sheep does not want to eat it. So, even if the land can recover a full year, it is not enough. I have seen Allan Savory’s videos in YouTube and read some articles. I am planning to buy the Foundations of Holistic Management E-Books but haven’t done so yet. Would they answer my questions? I understand your puzzlement. Let me see if I can clear it. Trees are wonderful and I love them. All the arguments for saving forests, replanting destroyed forests, etc. are valid and would happen almost inevitably with anyone practicing Holistic Management, or as soon as governments develop policy with the holistic framework in place of the reductionist one all governments use unknowingly. The problem lies with society’s total faith in technology and tree planting to address global desertification and climate change. This blind faith is not supported by any science known to me but rather by deep beliefs that have assumed scientific validity. We only have very limited tools (no one ever said that or thought that way until we developed the holistic framework and spelled this out). To this day society, and thus scientists, believe we have many options. In my TED Talk I said firmly that we have NO OPTION but to use livestock to address global man-made desertification playing a major role in climate change. Many academics ridiculed me, saying there are always many options, but they have not even given it thought. We are a tool-using animal and we cannot even drink water today without using the tool of technology (cup, tap, pipeline, pump, etc) unless we go to the nearest river and drink directly. To address desertification and climate change we have, as I pointed out in my talk, the following tools- 1. Technology in its many forms. 2. Fire to burn vegetation. 3. Resting the environment to allow nature to recover (conservation it is commonly called today). Apart from those 3 tools we now are only left with one other possibility and that is to use technology to plant trees, shrubs or grasses. That is the full human toolbox as we established when the US government engaged me to put some 2,000 scientists and others through a week of training in the use of the holistic framework in the early 1980s – and no one has come up with any other tool since. Society, and thus all our organizations/institutions, vilify livestock, blaming them for causing desertification and climate change. Society, and thus all institutions, believe in technology solving all problems. Society and thus institutions believe conservation restores and regenerates biodiversity in all environments. And society/institutions also believe planting trees will reverse man-made desertification. Such deep beliefs are always supported by our institutions that lead opposition and rejection of any new counter-intuitive or paradigm-shifting insights. Nearly 100 years of resting land (conservation) in the United States. Because of these beliefs no one ever questioned prestigious American universities when they claimed machines could do what was needed, and millions of dollars were spent by governments, and international agencies using machines and planting trees, shrubs and grasses to reverse desertification (Dixon Imprinter, etc) and now those lie rusting, having failed completely. 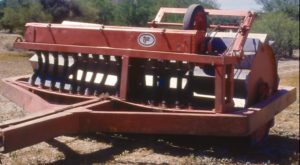 A land imprinter with seeder for planting grasses in rangeland and other desert environments. (Wikipedia). Ancient civilisations developed vast water-harvesting skills using swales and planting trees, etc. and all failed to prevent desertification. 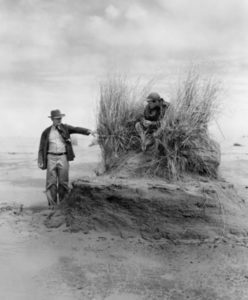 In America now nothing new is even tried and universities, academics, environmentalists and cattlemens’ organizations are just accepting desertification as natural in for example some national parks totally rested or conserved and that are desertifying worse than anything in Africa. Because society believes in planting trees and so Wangari Maathai became the firstKenyan woman to deservedly be awarded the Nobel Peace Prize for planting trees – but the trees only grow well enough to provide full ground cover where Kenya’s rainfall is above about 600mm (10 – 20% of Kenya), and most of Kenya with far lower rainfall is desertifying and increasingly violent. Next, the belief in planting trees is because of all the carbon they will store. However, trees or forests mainly store the carbon in the living and dead plant material and less so in the soil. Thus it is a short term storage that will help but not address either global desertification or climate change. Remember desertification is a major cause of climate change and truly vast regions of the world have rainfall from 500 to 50 mm or less (20 inches to 2 inches or less). These are dry deciduous forests, savannah and grassland almost all of which are desertifying over many Billions of hectares of land. For example the teak forests around my home in Africa are vast – larger than whole states in America – there are millions of trees but these forests are dying and not regenerating as the desertification continues. No point in planting trees. Another point. Mainstream agriculture supported by universities, governments, corporations is producing more than 75 Billion tons of dead eroding soil every year. Twenty times as much dead lost soil as food we need to feed every human alive today each year. Mainstream university/corporate agriculture is the most destructive industry ever in history and a major contribution to climate change. While agro-forestry, that is an ancient practice, can help enormously to stabilise cropland soils in humid regions planting trees can do little outside those minor regions of the world. Remember most of the great grain growing regions are based on former deep grassland soils, not the more shallow forest soils. 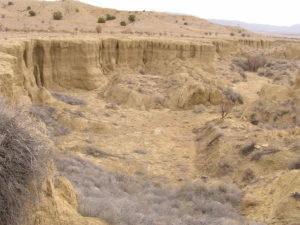 Soil Conservation picture showing depth of soil loss in former grassland New Mexico, USA. Finally if we look at our tools available we can see that if we take either global desertification or climate change seriously we simply do not have any tool, and thus option, to use over the largest regions of land, and that can also help regenerate cropland soils in all regions. That as I have pointed out one way or another for over half a century, can only be done by animals (mainly livestock in practice) as tools. And that we began working out how to do in the 1960’s and finally achieved success that can be consistent and guaranteed in the early 1980s through the holistic planned grazing process. One final nail in the technology/tree planting as the solution coffin. That action does not address the cause of either global desertification or climate change. Unless the cause is addressed frankly there is little if any hope long-term. The cause is not any lack of trees, and it is not being caused by livestock, coal or oil that are simply resources. The cause is 100% due to management. Management, and policies, that are and have always been reductionist. Reductionist management and policy development is that in which we always reduce the unavoidable web of social/cultural, economic and environmental complexity to such things as meeting needs, desires or solving problems as the context for management and policy actions. By using the holistic framework and a locally determined holistic context to guide management and policy we address the cause, and with the needed missing tool of livestock, we are able for the first time in history to address man-made desertification and climate change along with wise use of technology. I hope this clears the confusion for you, but if not please let me know.